Find the source of your magical powers to vanquish evil in Magical Mysteries - The Path of the Sorceress, a daring puzzle challenge. Aldera arrives at the doors of an ancient temple, weak and with a vague memory. She was once a great sorceress who protected her fantasy world from evil, but now, a mere mortal looking to regain her lost powers. While striving to restore her abilities, her enemies know this is the opportunity to strike a final blow. Can you help Aldera recoup her strength and defeat her enemies of darkness? Download free full version game today and start playing today! 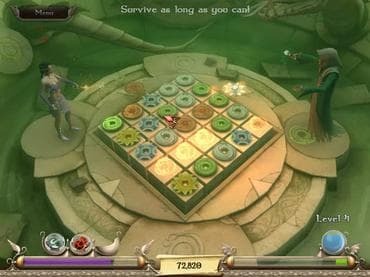 Free Game Features: - Enjoy unique head-to-head battles in the fantasy-driven Match 3 challenges; - Use your skills in 70 levels to search for enchanted scrolls and make helpful potions; - Improve your spells to dispense greater damage against the frightful creatures; - Play two extra mini-games and test three difficulty settings. If you have questions about Magical Mysteries game, please contact us using this form.